On My Plate: Wow Burger - Wow! or Wow? Wow Burger - Wow! or Wow? 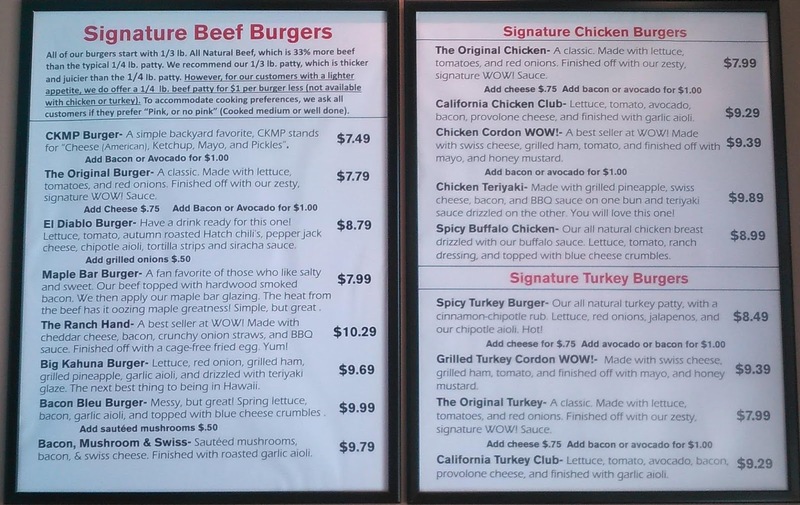 During this past winter I passed the construction of Wow Burger at (2905 SW Cedar Hills Blvd in Beaverton) during my weekly outings for groceries and comics. Yes, I am a comic book nerd as well as a foodie. Think Sheldon Cooper meets Anthony Bourdain, that's me. You might want to throw in a few dashes of FDR too. Anyway, I was intrigued by the name. It called forth images of a mind-blowing burger the eater would be talking about a year later. With that picture in mind, I couldn't wait for Wow open. My friend Dani and I got there a day or two after the Fourth around noon. The L-shaped restaurant looked like any typical "order at the counter" establishment, with menus on the wall and a counter up front. No big whoop. I ordered the Bacon Bleu Burger (spring lettuce, bacon, garlic aioli, and blue cheese crumbles) and Basil Parmesan Fries (McDonald's-esc cut fries tossed in a blend of kosher salt, parmesan cheese, garlic and basil) for $9.99. Right off the bat I was impressed that they cooked the beef to order. Of course, I got mine medium-rare. Slightly pink burger is juicy burger. As you know, I'm not a big fan of lettuce on a burger. However, I kept the greens on just so I could review the burger as it was intended to be eaten, and I'm glad I did. The juicy seasoned beef, smokey bacon, salty tangy bleu cheese, and savory garlic aioli all brought a lot of flavor, but were all very rich. The greens counter-balanced the richness of the other ingredients, making for one very well-executed burger. My only critique of the burger lies in the bacon. While it had a good smoky salty bacon flavor, it was limp and fatty. Part of what makes a bacon burger so good is the crunch of the crispy bacon. Floppy limp bacon takes the burger down a notch or two. 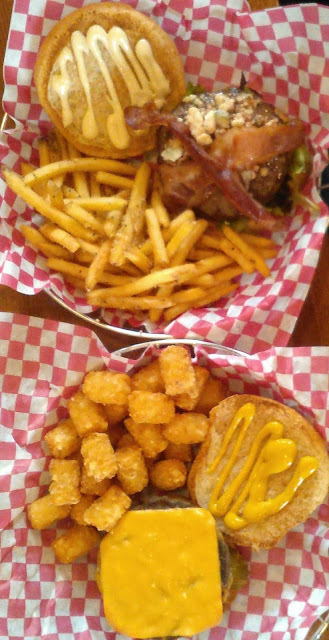 My friend, Dani, had the CKMP Burger (CKMP stands for “Cheese (American), Ketchup, Mayo, and Pickles) and Tator Tots (standard deep fried mini cylinders of potatoes seasoned with kosher salt) for $7.49. At least that's how it is on the menu. Dani does not like ketchup or mayo, so she got hers with yellow mustard and extra pickles. She also got her beef well-done. While it was executed the way she ordered, it's hard to comment anymore about it with one exception. THE PICKLES. I've eaten a lot of pickles in my 48 years, but these kosher pickles were some of the best I've had. I don't know if they make them themselves with extra garlic, or if they have stumbled onto a really good brand, but they were exceptional. If they were to deep fry them, and add them to the menu as a side, now that marijuana is legal in Oregon, they would be packed at 4:25 every afternoon. All in all, I liked WOW Burger. 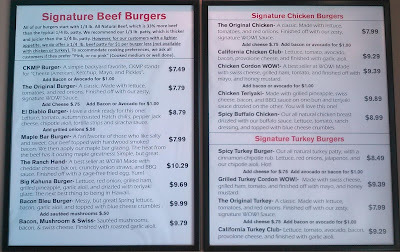 The food is kind of expensive, about on par with Five Guys. The burger was good, but it's the fries I would come back for. All things considered, I would give WOW Burger an 7/10 stars.